As more and more deer hunters switch to ground blinds and box blinds, Mossy Oak delivers its Eclipse pattern to help those hunters disappear into the dark recesses of such blinds. Oh, the crazy kind of thoughts you get when the combination of flu meds, a new round of Star Wars movie mania, and the local delivery man all collide on the front door step. Just a few days before a Texas Hill Country deer hunt, that is. Thoughts like this one: I'm not sure if Mossy Oak Camouflage founder Toxey Haas needs a new pitch-man for his company's latest creation the Eclipse pattern but if he does, can there be any one more perfectly suited for that role than the villainous Darth Vader? You know, as actor James Earl Jones' iconic voice breathes heavily in a commercial, uttering an advertising phrase that goes something like this: "Come to the dark side of the camouflage world, the world of Mossy Oak Eclipse." Ok, maybe that would-be marketing scheme is just a little bit far-fetched. But the thought behind it might be sound after the well-known West Point, Miss. based camouflage maker unveiled its Eclipse pattern late last summer at the Mossy Oak online store and at Walmart locations around the country, just in time for 2017-18 deer hunting seasons. As a pattern that aims to make a hunter virtually disappear in the dark recesses of either a ground blind or a box blind, I was introduced to Eclipse during a recent December whitetail hunt at Vatoville, a sprawling 9,300+ acre ranch on the western edge of the Texas Hill Country about an hour's drive from San Angelo. Pulled from the box, the pattern certainly caught my attention. But as the Christmas movie saying goes from The Santa Clause film, I believe? once I saw how it looked and performed in a real blind, there's no doubt that believing is seeing. Featuring a dark overlay version of Mossy Oak's well-known Break-Up Country pattern, along with a few snippets that expose the regular version of the camo pattern, the idea is to erase a hunter's outline inside the shadowy recesses of a blind. The kind of blinds that are becoming more and more common in deer hunting circles it seems. "There's been a rapid increase and transition from treestand hunting to ground blind hunting," said Mossy Oak's Jake Meyer. "There are so many reasons for that, number one of which might be safety there's not much that can really go wrong in a ground blind versus being 20-feet up in a tree. "And scent control is also a huge advantage from hunting out of a ground blind," he added. "Ground blinds also offer mobility you can probably place a ground blind just about anywhere, as long as it's relatively flat ground. You can find the best hunting spot in the world, but you'll still need to find a good tree to hang a treestand in if that's the way you're hunting. "Finally, ground blinds are great for introducing youth and new hunters to hunting, which is a huge passion for Mossy Oak." So is making great camouflage, something that has been happening since 1986 when Hass famously grabbed a handful of dirt, leaves, and twigs and looked for the nearest textile mill to create hunting camo that would help a hunter blend in and disappear. Now, that camo concept moves from the bottomlands, uplands, and mountains of America to the shadowy recesses of hunting blinds. "There's no specific pattern tailored to the ground blind hunter, and that's where Mossy Oak Eclipse comes into play," said Meyer. "This dark camo is based on Break-Up Country, which is our most popular pattern today. That's what is embedded in Eclipse. "There's a wide variety of pieces available, from pants, to ¼-zip pullovers, to jackets, to caps," he added. "There's also a wide variety of accessories such as floor mats for your (vehicle), seat covers, stuff like that." If ground blinds are common in the cornfields, bottomlands, and rolling hills of the American Midwest, the same idea works very well in Texas where tower blinds and box blinds rule the deer hunting landscape. Because of that, the new Mossy Oak Eclipse pattern is very much at home at places like the Lone Star State's Vatoville. Because fabric or fiberglass, elevated or low to the ground, all blind hunters need the same basic thing to happen. "You want to blend into that blind's darkness without any type of bright colors showing," said Meyer. "That's the ultimate purpose of camouflage to blend in and Eclipse helps you do so in a ground blind or an elevated platform." While we tested the pattern at Vatoville, Meyer pointed out that one key principle to all blind hunting be it a ground blind or a tower blind is to keep the confines of that blind as dark as possible. He says that one way to do that is to keep most windows closed in a blind, something that aids in keeping light and a hunter's scent at bay. "The fewer windows that are opened in a blind, the better," he said. 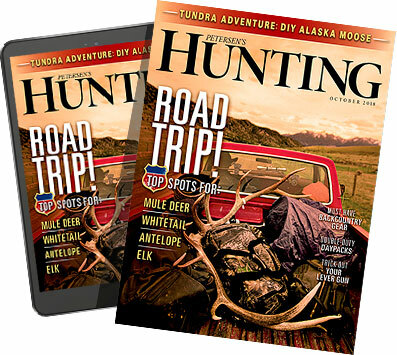 "Anytime you hunt whitetails, you're trying to fool their nose, their ears, and their eyes. Keeping most blind windows closed and using the Eclipse pattern inside a blind can certainly help a hunter remain undetected by whitetails." A task made a little bit easier by staying on the dark side of the camouflage world, blending into the inky shadows of a hunting blind while wearing Mossy Oak's new Eclipse pattern. A successful deer hunting move even if you don't wear a big visor and talk with ominous, heavy, and labored breathing.